From these events, 24 pairs together with pairs coming from on-line tournaments will qualify to attend the Final which will be held in either Shanghai or Sanya from 26th – 28th October with players arriving on 25th and departing on 29th. There will be a subsidy (800 US$ for players coming from Asia – 1200 US$ for players coming from other continents) for travel expenses and bed and breakfast accommodation will be provided free of charge for four nights (25th -29th October) based on two players sharing a double room. Additional accommodation or single rooms will be charged at the hotel rate. The final will have a prize fund of US$ 20,000. The highest scoring pairs in 3rd place in any session to complete the required number of pairs in the final provided they are not already eligible as a result of being a winner of one of the six tournaments or a “continental” winner. The commentary will be provided via email – the cost of printing and distributing the booklets would mean that we would have to raise the price considerably and that would make the event much more expensive for the participants. So instead we will be providing the commentary as a downloadable PDF file after the event. Do join us for this event, which is enormously good fun and gives you the chance to compete against other pairs from all over the world – a rare opportunity indeed. Because it is scored using the ECatsBridge system, you get masses of information showing you exactly how you fared on the night. You can watch as clubs upload from all around the world, and get the “buzz” of excitement as the scores change. Click here for last years’ results so you can see how they are displayed and the wealth of information generated for them. This is an annual event, born in 1986, with no limit to the number of centres, all playing the same boards across the world. 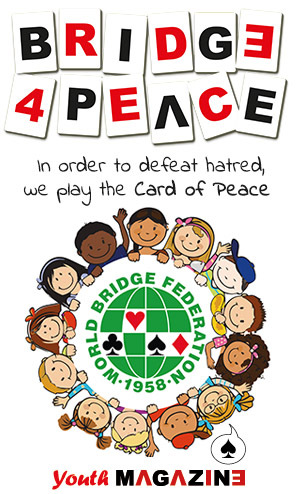 The contest is open to clubs and other organisations in the territory of every National Bridge Organisation invited by the WBF to participate. Established bridge organisations in territories not yet affiliated to the WBF may be considered for invitation under special conditions. WBF Year Points are awarded to the leading pairs in the rankings, both overall and for zonal and national rankings. Most NBOs also award their own Master points, usually on a scale appropriate to a national simultaneous Pairs. Epson sponsored the event from 1986 to 1995. In 1996 Alcatel was the official sponsor. In 1987, the Epson World Wide Bridge Contest was recognised as the biggest sporting event of all time and, as such, was published in the Guinness Book of Records. It was mentioned again in both 1988 and 1989. 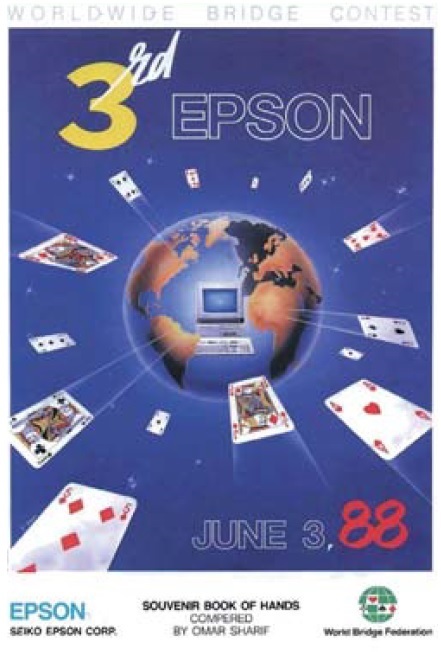 The poster for the third Epson World-wide Bridge Contest won the first prize in a major sponsorship competition, poster section, in March 1988.